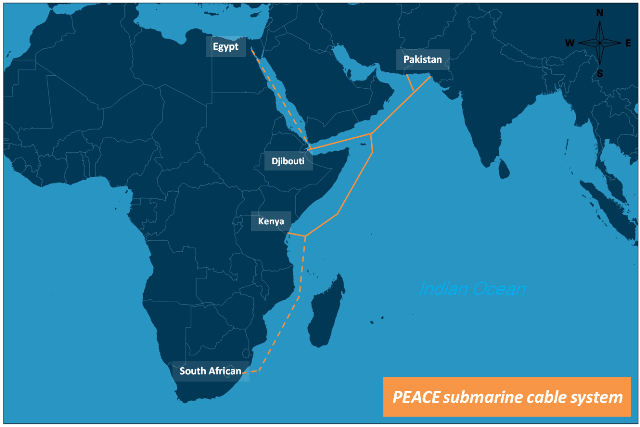 Huawei Marine says it has commenced work on Desk Study and Marine Survey works in conjunction with key investor Tropic Science to construct the Pakistan East Africa Cable Express (PEACE) submarine cable, which connects South Asia with East Africa. With initial work underway, the project is targeted for completion in Q4, 2019. The first phase of the PEACE cable system spanning 6,200 kilometers in length will link Pakistan (Gwadar and Karachi), Djibouti, Somalia and Kenya. The second phase will provide the extended option to South Africa and Europe with a total length of about 13,000 km. The submarine cable system based on 200G DWDM technology, will provide up to 60T design capacity. The PEACE system will provide a new information expressway for the interconnection among Asia, Africa and Europe by connecting with the existing land and subsea cables, greatly reducing the route length and latency between Chine-Africa and China–Europe. In November, Tropic Science and Huawei Marine signed the construction contract of the PEACE submarine cable project.